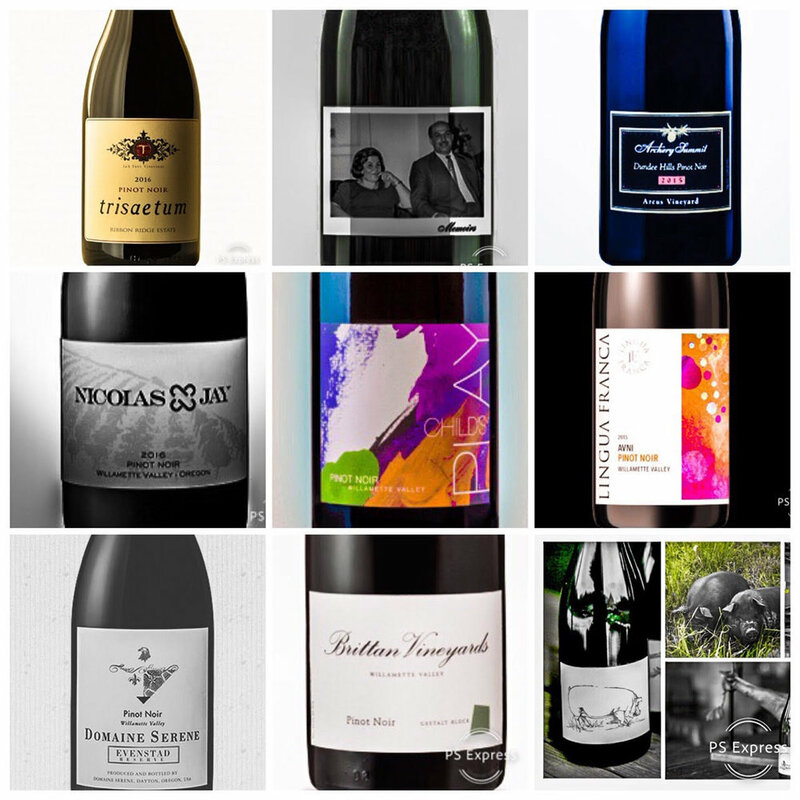 I have selected ten beautiful new Oregon Pinot Noirs to sample for yourself in the new year. It is painfully obvious that Pinot Noir has won the war as Oregon’s top red varietal. Oregon Wine has seen incredible increases in sales, as Oregon Pinot Noir continues to outperform many others in the retail market. I personally love the range of this varietal for during winter as Oregon Pinot Noir accompanies food so marvelously and also shows exceedingly diverse character depending on not only the wine’s AVA but also winemaking style. The Willamette Valley has wonderful diversity in soils, elevation and terroir and new AVAs continue to emerge on the scene with the Van-Duzer Corridor AVA becoming the seventh sub-AVA in the valley. I have selected ten new Oregon Pinot Noirs to be on the lookout for in 2019 that showcase the wonderful diversity of the Willamette Valley. Whether it is from a boutique producer or one of the large producers, Oregon wines have been performing remarkably well in the past few years, and I want to showcase not only a handful of the top wines that I have sampled in the past year but also some Pinot Noirs that you might not have heard of before. I hope you enjoy these beautiful wines as much as I have.. Cheers to a great 2019 for you all! While this wine is obviously not inexpensive, it is one of the wines of the vintage. Toasty oak wraps around copious red and dark fruits that makes this sinfully good now. Having tried every one of these wines back fifteen plus years, I think this is the best ‘Evenstad Reserve’ that has been made. This wine is for those who love the richer side of Pinot Noir. The ‘Arcus Estate’ is one of the great wines made in the Dundee Hills AVA and is one for the cellar. The texture to this wine is simply marvelous as red and dark fruits enliven the senses. If enjoying in its youth, be sure to give this an hour decant. Ripe, juicy and downright delicious, with a light carbonic component, this is a simply irresistible wine by one of Oregon’s great winemakers, Brian Marcy. Pick up a bottle while you can still find one. This froward and delicious wine shows really nice stony terroir and is a great example of the Eola-Amity Hills with good balance and weight from the heat of the vintage. It is downright delicious now but will cellar well for a decade. This is one of the great Oregon wineries you may have never heard of. The ‘Gestalt Block’ shows marvelous stony terroir as the Pinot Noir vines are set on broken basalt. Robert Brittan, former winemaker at Stags’ Leap, is a master at creating gorgeous, terroir-driven, Pinot Noirs like this one. This is a seriously good wine for the price. This is another great Oregon winery that you might not have heard of. Mo Ayoub crafts some seriously good wines and this particular wine is a homage to his family, sourced from a host of great Willamette Valley Vineyards. It is delicious now but will also cellar well for a decade or more. This wine is for those who love a great combination of freshness and richness in their Pinot. One of the great value Pinot Noirs on the retail market, this is largely sourced from 6% Yamhill-Carlton (56% and Eola-Amity Hills AVAs (35%), as the wine delivers serious dark and red fruit flavors with great structure. I absolutely love this new wine. There is a great combination of rich dark fruit flavors with good balance. It is simply a beautiful wine that will age gracefully for a decade or more. One of the great boutique wineries you might not have heard of, I have followed the wines of Stag Hollow since tasting their absolutely epic 2002 ‘Reserve’ Pinot Noir. This new edition has gobs of red and dark fruits with a silky texture. It is downright delicious right now but has a long life ahead of it.